Driverless cars come one step closer | What Car? 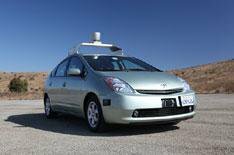 Driverless cars have been legalised in the US State of Nevada after lobbying by Google. The search engine giant has developed the technology and stands to benefit from its introduction. The new legislation paves the way for cars that will drive themselves with no intervention from occupants. An autonomous test vehicle has racked up 1000s of miles on the roads of California. A qualified driver has sat at the controls but not touched them to comply with the state's requirement for a human to be nominally in charge at all times. Only one collision was recorded, when another car hit the Google-controlled car while it was stationary at a junction. Taxis and delivery vans are now expected to go on trial with the new technology. It's not just in America where such cars are being tested. The French city of La Rochelle has a small fleet of robot taxis that can be called to ranks on demand. Lasers are used to detect pedestrians and other traffic hazards, but because French law bars autonomous vehicles on public roads, a conductor has to be present at all times. The EU-financed Safe Road Trains for the Environment (SARTRE) programme has been developing a system where a convoy of drone cars follows a lead vehicle driven by a professional driver. The idea is that computer-controlled platoons of cars could make more efficient and safer use of motorways by travelling close together. The SARTRE programme estimates that accidents could be reduced by 80% and that fuel consumption and emissions would both improve by 20%.